Uppsala, Sweden—October 24, 2016—IAR Systems® announces that Noa Technologies, an innovator in the area of sustainable mobility, is using the complete development toolchain IAR Embedded Workbench® to develop an innovative Internet of Things (IoT) fleet management solution. Thanks to the powerful debugging and compiler capabilities of IAR Embedded Workbench, the engineers at Noa are able to speed up their development cycle. “IAR Systems’ products allow us to reduce the time spent on debugging issues during product development, which is critical for a quick product development cycle,” says Pedro Silva, Hardware Engineering Manager, Noa Technologies. Noa's all-inclusive industrial IoT solution enables easily scalable management of moving assets along the entire asset lifecycle. 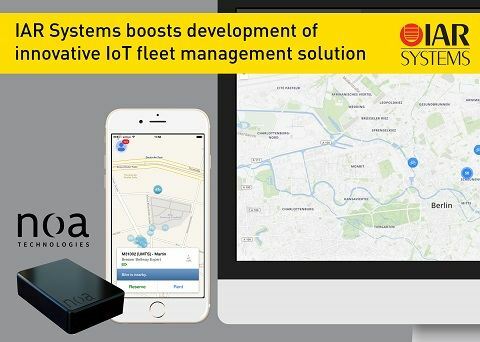 The solution consists of a fleet management software, which is a cloud-based platform for identifying, tracking, managing and optimizing connected devices, and an IoT device that integrates into any moving asset, turning the fleet into a data creation hub. As a start, the company is applying the solution to the bike sharing market. Thanks to a powerful product portfolio and global support services, IAR Systems enables companies worldwide in many different industries to build products for today and innovations of tomorrow. To support innovative projects in renewable energy and clean-tech fields, IAR Systems offers the sponsor program IAR Green Innovation Program that gives small, entrepreneurial technology companies access to powerful development tools. Learn more about IAR Systems at www.iar.com.